Go back to the era of royalty by travelling in luxury trains operated by Indian Railways. The luxury train tours in India enable tourists to explore the significant historical and cultural heritage sites of the vast country in style befitting the royalty which ruled India before independence. The luxury trains in India are characterised by the majestic decor, gourmet cuisine and a plethora of modern amenities. Palace on Wheels- Palace on Wheels is the pioneer of luxury trains in India. Started in 1982, Palace on Wheels boasts of interiors lavishly decorated to resembles palaces of erstwhile Maharajas of Rajasthan, bars, spa, lounge and a host of amenities found in five-star hotels. The train starts from Delhi and covers Jaipur, Sawai Madhopur, Chittorgarh, Udaipur, Jaisalmer, Jodhpur, Bharatpur, and Agra. Golden Chariot- KSTDC operates golden Chariot. The train has 19 coaches and consists of two restaurants, gym, lounge bar, spa and conference room apart from the great cabins for accommodation. Golden Chariot tours have been divided into two categories. Pride of South tour starts from Bangalore and covers, Mysore, Hampi, Belur, Kabini, Badami and Goa. Southern Splendour tour also starts from Bangalore and covers Chennai, Mahabalipuram, Pondicherry, Thanjavur, Madurai, Thiruvananthapuram, Alleppey and Kochi. 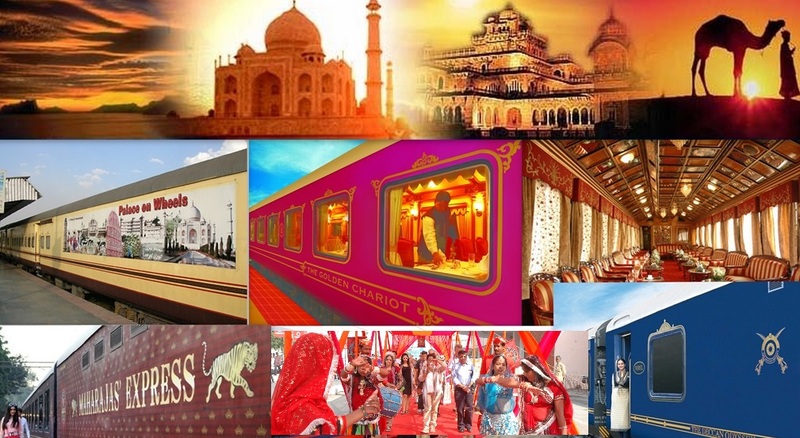 Maharajas Express- Maharajas Express, started in 2010, is the newest luxury train in India. The Maharajas Express is characterised by gourmet dining, well-stocked bar, internet facility, lavish suites, individual temperature control, LCD TVs and a host of other amenities. The train offers five different tours covering places such as Delhi, Agra, Khajuraho, Ajanta, Mumbai, Jaipur, Jodhpur, Udaipur, Bikaner, Orchha, Gwalior, Varanasi and Lucknow. Deccan Odyssey– Deccan Odyssey is run Maharashtra MTDC and Indian Railways jointly. This luxury train consists of restaurants, bar, business centre, sauna, lounges and spa. The palatial interiors and five-star amenities make it a famous luxury train. The train covers various locations along the Konkan coast such as Goa, Sindhudurg, Nasik, Ajanta and Ellora Caves, Ratnagiri, Aurangabad, Pune, etc. The Indian luxury train tours are, but the rates are worth the luxury afforded by the trains. The starting fares of the luxury trains have been listed here. Palace on Wheels- Over Rs 200,000 for Indian nationals and $3500 for foreign tourists. Golden Chariot- Over Rs 300,000 for Indian nationals and $8000-9000 for foreign tourists. Maharajas Express- Between Rs 2,50,000 and 4,50,000 depending upon the itinerary. Deccan Odyssey- More than Rs 3,50,00 for Indian nationals and $5810 for foreign tourists.